Rajiv Halim is a saxophonist, composer, and educator from Chicago, IL. He was born to immigrant parents from Belize on September 15, 1990, incidentally the same birth day as saxophonist, Cannonball Adderley. However, it was Charlie Parker who became the beacon that sparked Rajiv’s love for improvisation and creative music. The Rajiv Halim Quintet performs regularly in the greater Chicagoland area and features trumpeter Victor Garcia, guitarist Scott Hesse, bassist Junius Paul, and drummer Michael Piolet. Rajiv’s debut album “Foundation” was released in August 2015 and is available for digital purchase worldwide. Rajiv also performs with well-known local bands such as Ron Haynes’ Game Changers, The Xavier Breaker Coalition, and Robert Irving III’s Generations. Internationally, Rajiv has performed in Canada; in Poznan, Poland at the Made in Chicago Festival in both 2011 and 2016; in Belize at The Bliss Institute for Performing Arts; and in Taichung City, Taiwan at the 2014 Taichung Jazz Festival. Nationally, Rajiv has performed and/or recorded with many great musicians: Jennifer Hudson, Chance The Rapper, Rudresh Mahanthappa, Ernie Watts, Wess “Warmdaddy” Anderson, Cory Henry, Richard Gibbs, Curtis Lundy, Antonio Hart, Lisa Henry, Von Freeman, Mike Stern, Crucial Conflict, Martha Reeves, Bob Mintzer, The Four Tops, Ernest Dawkins, Maggie Brown, Orbert Davis, Maurice Brown, Corey Wilkes, Marquis Hill and others. Locally, Rajiv has also performed in the 2013, 2014, 2015, and 2016 Chicago Jazz Festivals. A highlight of Rajiv’s recording career came in 2016 when he contributed saxophone parts to the composition “Finish Line” by Chance the Rapper for his project “Coloring Book”, which won the 2017 Grammy Award for “Best Rap Album”. Rajiv has also won awards as a solo artist. 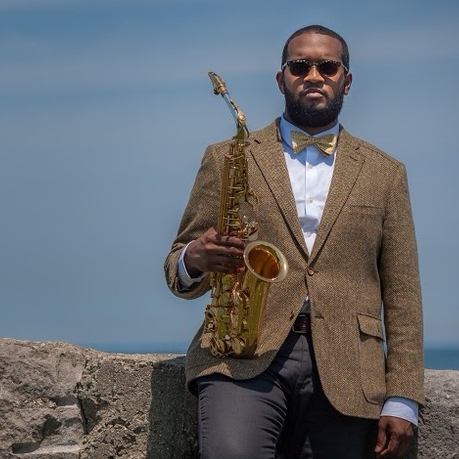 He placed second at the first annual “Saxophone Idol” International Competition (2013), organized by the Keilwerth Saxophone Company; the judges included legendary saxophonist Ernie Watts. Rajiv also competed in the 2014 Taichung Saxophone Competition in Taiwan. After the first round of elimination, twenty-nine contestants were invited over to Taichung City, Taiwan from eight countries, spanning three continents for the final rounds; Rajiv took second place in this international competition. When Rajiv isn’t writing, playing, or practicing, he can be found at Oak Park River Forest High School teaching private saxophone lessons, at St. Patrick High School, teaching saxophone sectionals and giving private lessons, and at Terra Sounds School of Music & Arts in, teaching private woodwind lessons. Rajiv is an endorsing artist for Jody Jazz Saxophone Mouthpieces and plays them exclusively.